Peer pressure is having a big impact on how children communicate with each other, making them more dependent on staying connected to the Internet, according to new research carried out by Kaspersky Lab and iconKids & Youth. Parents provide their kids with connected devices to help them maintain contacts with their friends, and children themselves claim that they use these devices because their friends do so. The Connected Kids survey found that over half of parents (52%) provide their children with mobile devices so that they can communicate with their peers. The research also revealed that one in four (27%) parents provide their children with connected devices because of concerns that their child would be treated as an outsider without them. Kids are increasingly using connected devices as an essential means of communicating with their friends and peer pressure is playing a role in pushing modern friendships online. 44% of young people say they use a connected device because their friends do and one third of kids (32%) keep in touch with their friends more often online than offline. The importance attributed to online friendships is as much as real world friendships for many children. Over two fifths of kids (42%) have claimed that they are equally afraid to lose friends online and offline, and one in ten (11%) are more afraid to lose friends online than offline. 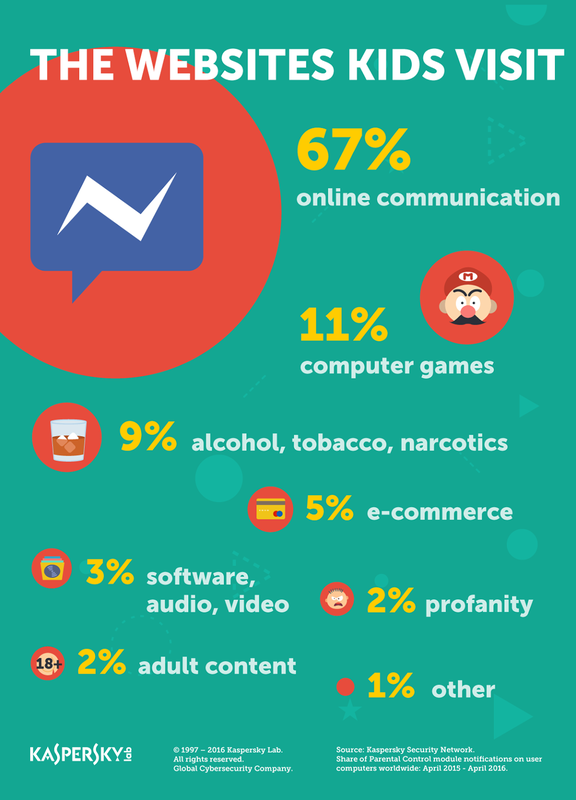 Use of modern communication platforms is a major online activity for young people, including social media (35%) and messaging apps (35%). The research also reveals that the older children get, the less likely they are to meet friends face-to-face, preferring to use instant messengers, social networks and SMS to communicate. 76% of kids aged between eight and 10 prefer real world contact, as opposed to only 46% of teenagers aged 14-16. “Online communication has become such a substantial part of modern kids’ lives that parents should be paying extra attention to it. Kids are now experiencing peer pressure to use online tools as part of everyday communication and it’s important that parents are as vigilant as possible to the threats and aware of what their kids are doing on the Internet. It is also very important to talk to the child, explain online dangers and the advantages of communicating in the offline world. Online safety programs allow parents to see what is happening with their children online and to take measures when needed to protect them,” comments Andrei Mochola, Head of Consumer Business at Kaspersky Lab. “Online communication adds a whole new dimension to peer interaction, underlining the importance of social and emotional skill development – an area consistently overlooked in school curricula. Young people today generally cultivate their friendships in a blended on- and offline environment, and we are already getting a glimpse of the problems that can arise from this form of socialization. We at European Schoolnet believe that developing a young person’s capacity for self-reflection and empathy is essential. As the most impactful way for a child to learn is by example, it is up to parents to show their children how enjoyable and entertaining face-to-face conversations can be and that real life is just as much fun and entertaining as virtual life,” says Janice Richardson, Senior Advisor at European Schoolnet.